The 1918 - 1919 White stamp issues of the Kuban, were carefully printed in Ekaterinodar and normally yield crisp, clean typographic overprints. 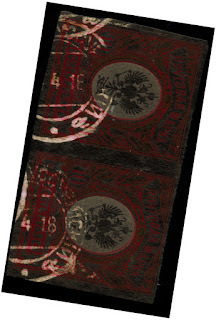 Errors and varieties exist but the printing plates were kept clean and aligned carefully. 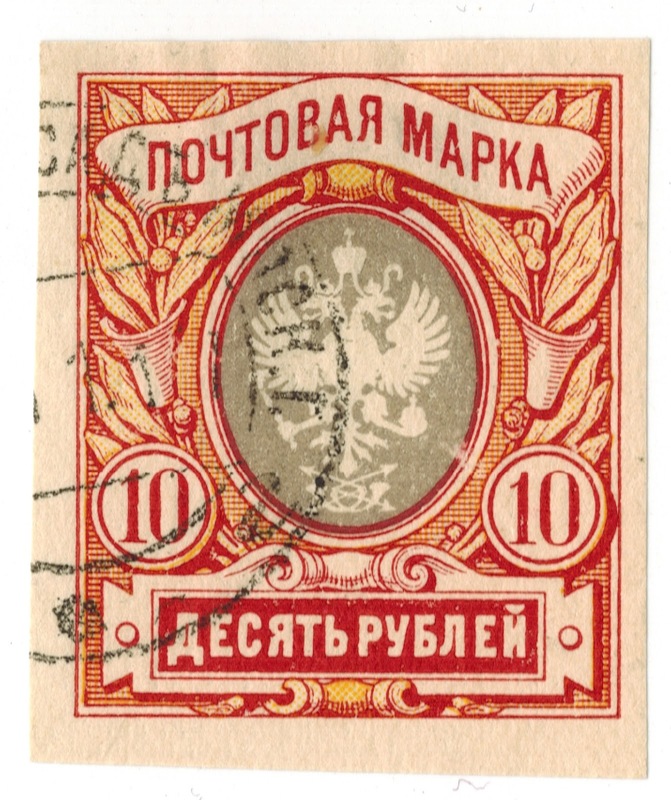 This is very obvious for the 10 rouble overprints on Postal Savings Bank stamps. 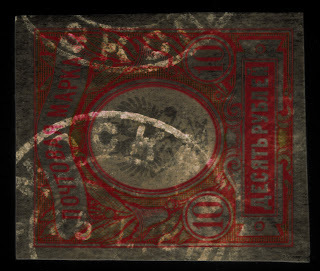 Here the plates were prepared in such a way that if the plate was carefully applied the "10" obscured the 1, 5 or 10 of the underlying stamp and the "rublei"obscured the underlying "kopeka". See the top row of stamps in the illustration below. 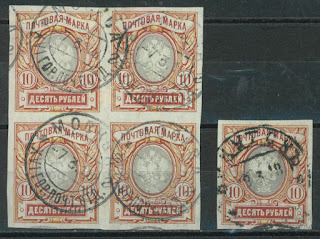 Most forgeries make the mistake of placing the "10" centrally above the "rublei" so that the "10" never obscures the underlying 1, 5 or 10 - see the rest of the stamps below, all of which are forgeries. 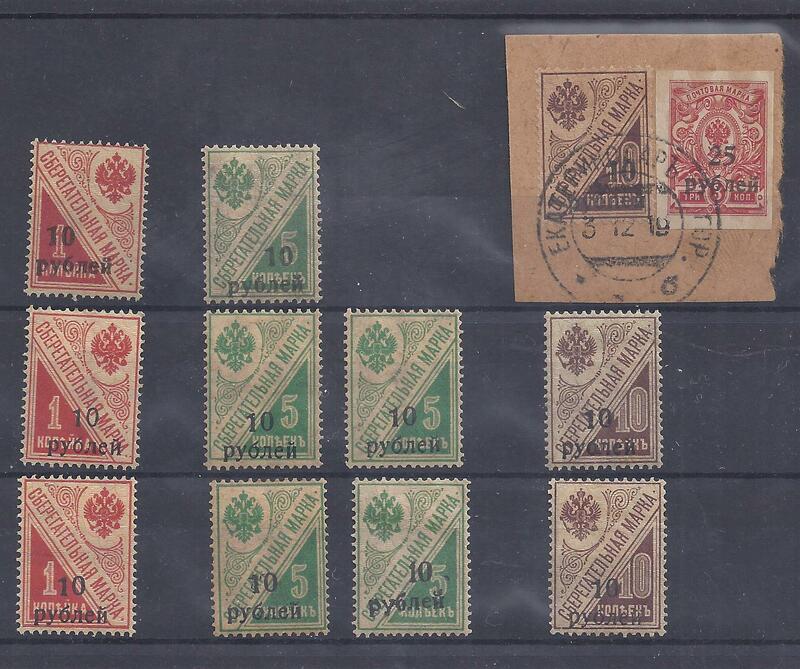 Notice that on the basic stamps, the "1" is aligned to the left and the "5" and "10" to the right. As a result, the Ekaterinodar printer had to prepare two plates for the overprinting. The forgers economise and use just one. 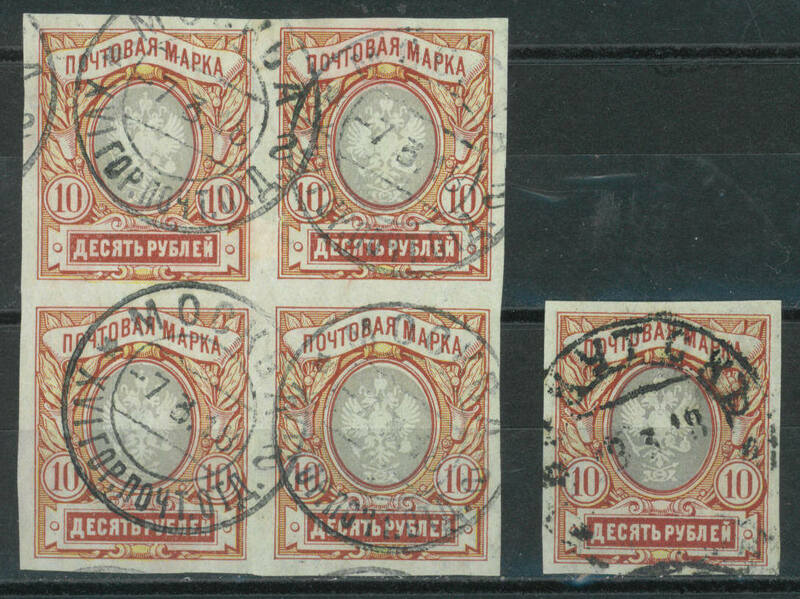 One of the forgeries (bottom row, third stamp from left) does realise that the "10" should be above the letter L of rublei, not the letter B, but the quality of the lettering is very poor in comparison to the genuine stamps. 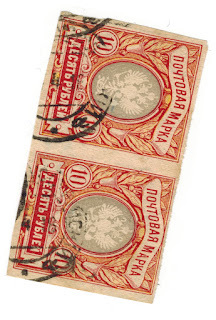 In a previous Blog (7 March 2015), I have written about the limited distribution of the Imperial Russian Arms 10 rouble imperforate which is most frequently found with Ukrainian postmarks of 1918. 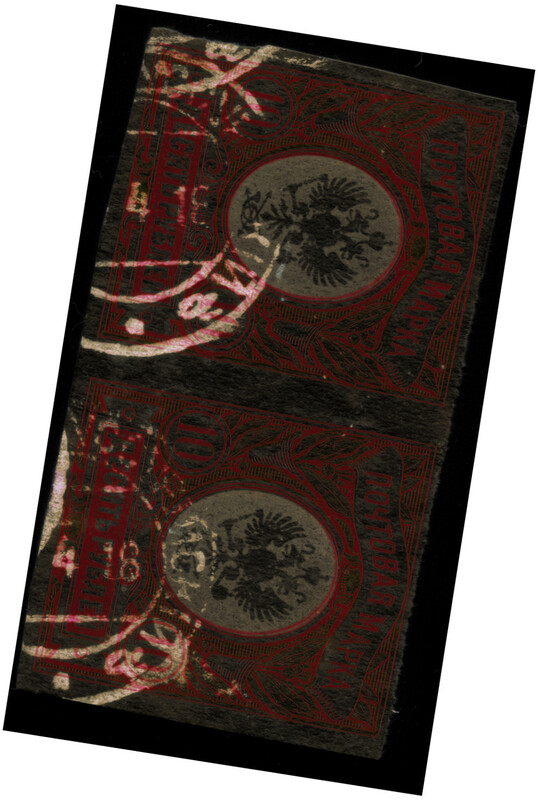 Today, I can add an early use in Russia proper: below is a pair of stamps, with shifted centre, used at IRKUTSK 8 4 18. 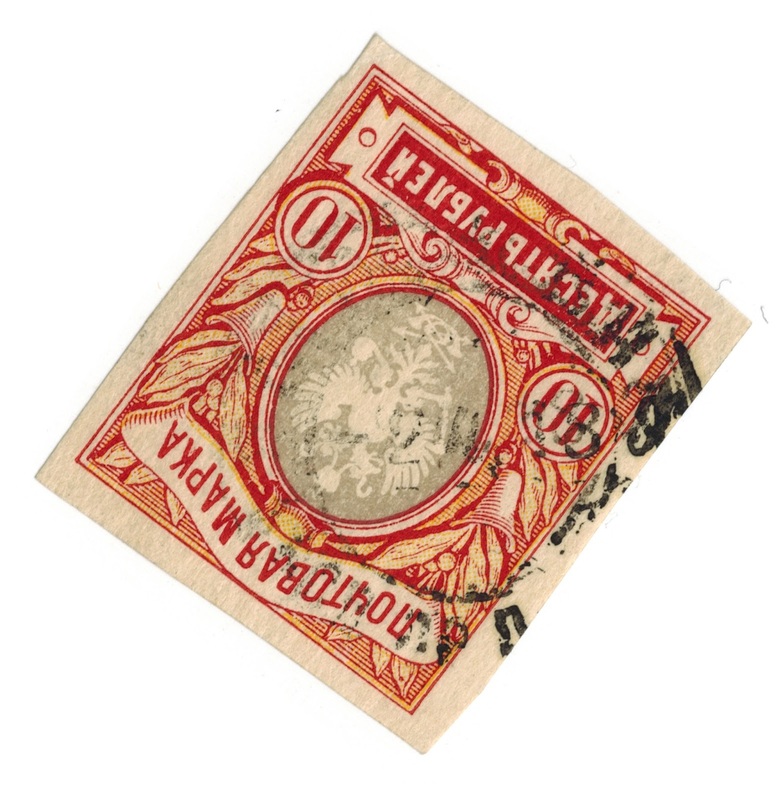 The vertical arrangment suggets use on a formular card (Parcel or Money Transfer). Added 7 November 2016: Grzergorz Mikula in Warsaw kindly send me these very interesting examples, confirming use in Moscow. His colour filters allow us to see the dates clearly. The first two stamps have Moscow cancellations. 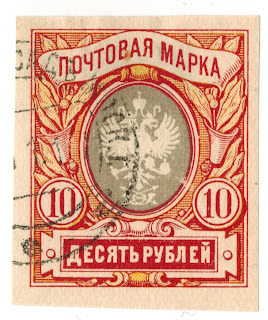 The third adds Nikolsk Ussurisk to the list of places where this stamps was used. 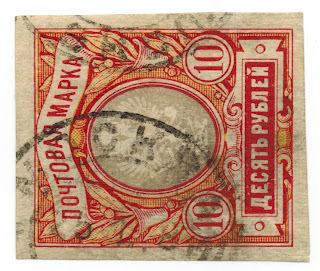 The last stamp shows a November 1917 cancellation which is the earliest I have seen. 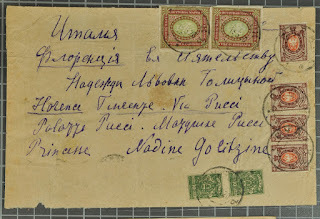 The postmark is from a village [Posad] in Moscow Guberniya. The most likely Posad, I think, is SERGIEVSKII POSAD which was a centre of Russian Orthodox church activity. 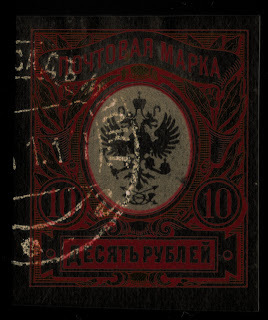 Was There a Russian Refugee Post in Constantinople? 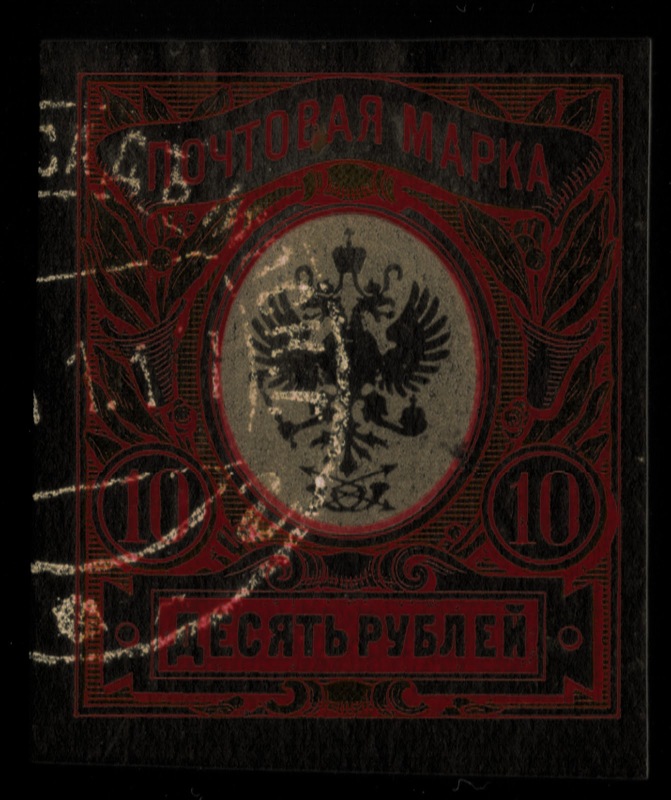 I am one of those who thinks that there was no postal service which used the stamps of the (White) Russian Refugee Post in 1920 - 1921 and that all the covers and cards which exist were produced by a group of philatelists sitting round a Constantinople table. 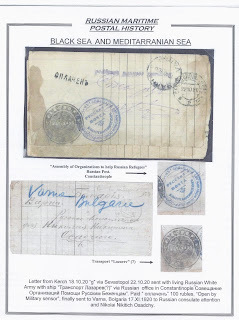 No doubt they were inspired by the presence of so many Russian refugees in Constantinople following the evacuation of General Wrangel's forces from Crimea at the end of 1920 but my assumption is that those refugees were expected to make use of the Turkish postal service. Nor do I think that the pre-war Russian post offices re-opened in Turkey after the end of World War One, though there were philatelic speculators who hoped they would and who prepared stamps in anticipation - the ROPIT overprints on old Russian Levant stamps (which they were clearly able to obtain in quantity) and the elaborate "Ship" fantasies probably printed in Constantinople by the Armenian printing company of V M Essayan (Yessayan). But there are other questions to be asked, especially about the immediately preceding period 1918 - 20. 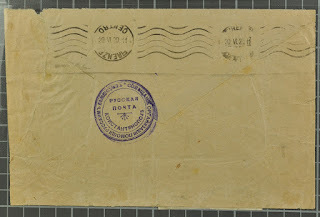 For example, were Ukrainian governments or White Russian governments (Denikin, Wrangel) able to connect to any international postal service and if so how. 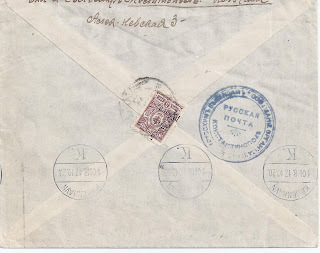 It is known, for example, that Trident - franked covers did leave from Odessa /Odesa on British ships and probably on ships of other nationalities though the status of the frankings is obscure because they are often left uncancelled but then have cachets added indicating, for example, "Received from His Majesty's Ships" and no Postage Due to be levied. Below is an intriguing ordinary letter for which I have not seen any similar examples. 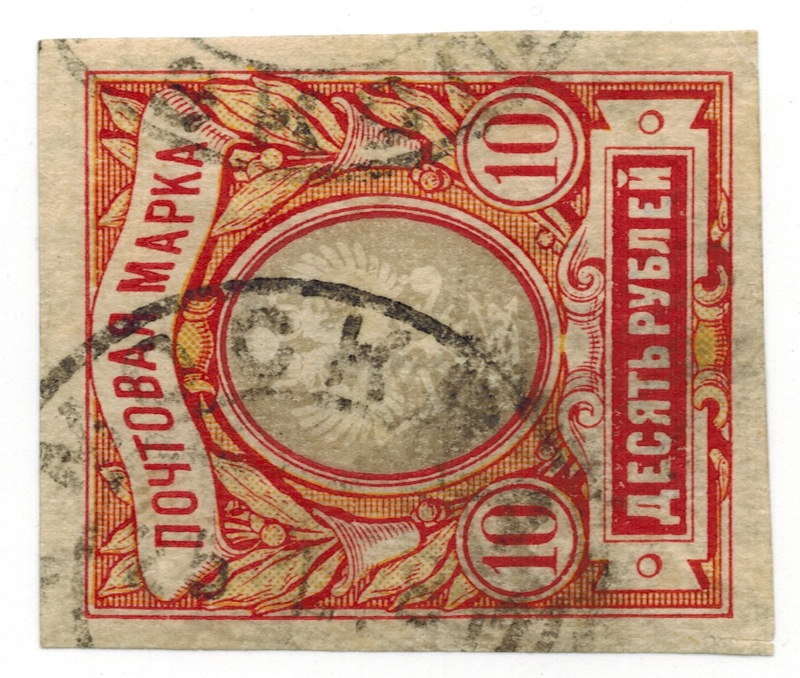 It is addressed to a company in Denmark and has an ordinary machine receiver cancel on the back dated 17 October 1920, a month before White forces were finally defeated in south Russia and Crimea. It started out from MELITOPOL TAVR [ Taurida] 5 9 20. 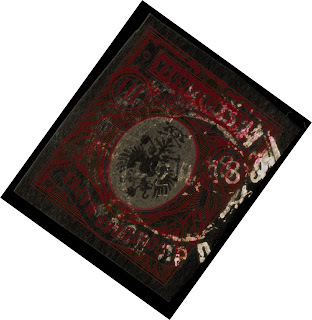 At this date Melitopol was still under White control - it was taken by the Red Army at the very end of October 1920. 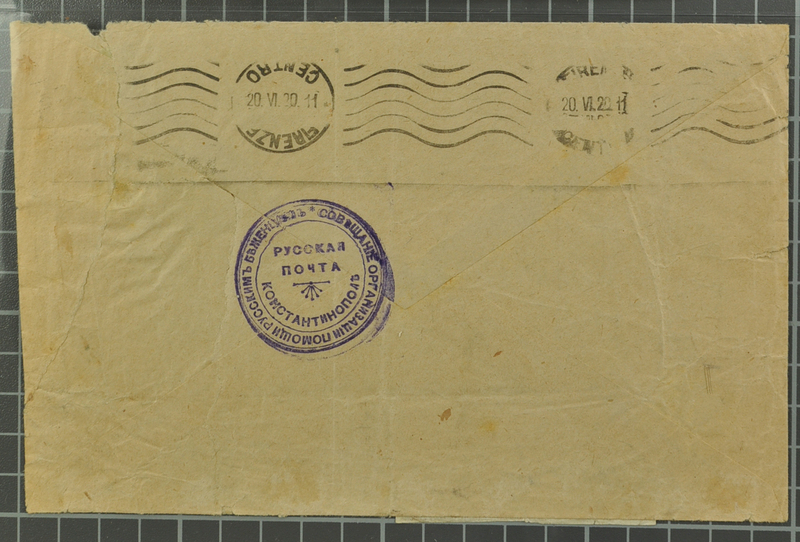 The letter is franked by a single copy of a late Wrangel / Crimea issue which revalues an Imperial 5 kopeck perforated stamp to 5 rubles by means of a simple typographic overprint. Curiously, this looks exactly like a Soviet x 100 revaluation created following the revaulation instructions issued in March 1920. 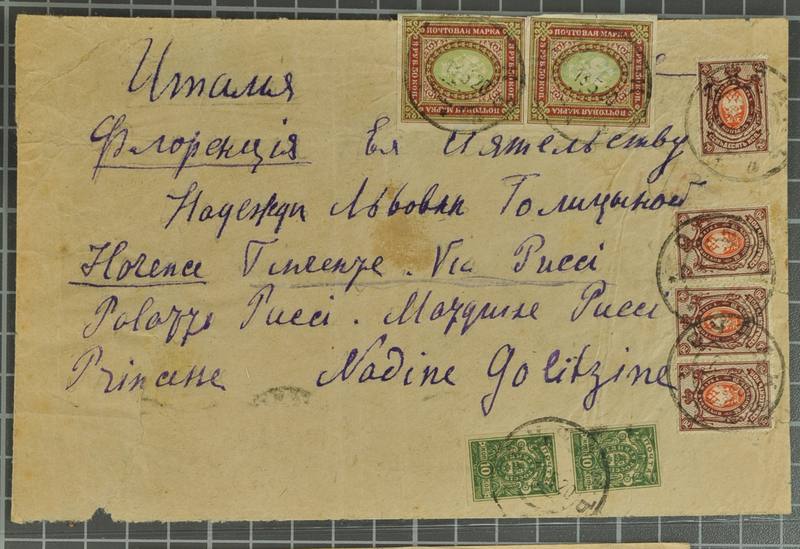 Even more curiously, and perhaps relevantly, in the second RSFSR Foreign Tariff of 1920 the tariff for an ordinary foreign letter was 5 roubles so by the time it reached Denmark, this letter would look exactly like a correctly franked foreign letter arriving from Soviet Russia. But this is definitely a White letter which was routed to Constantinople where it received some kind of transit mark. But not an Ottoman Turkish one. 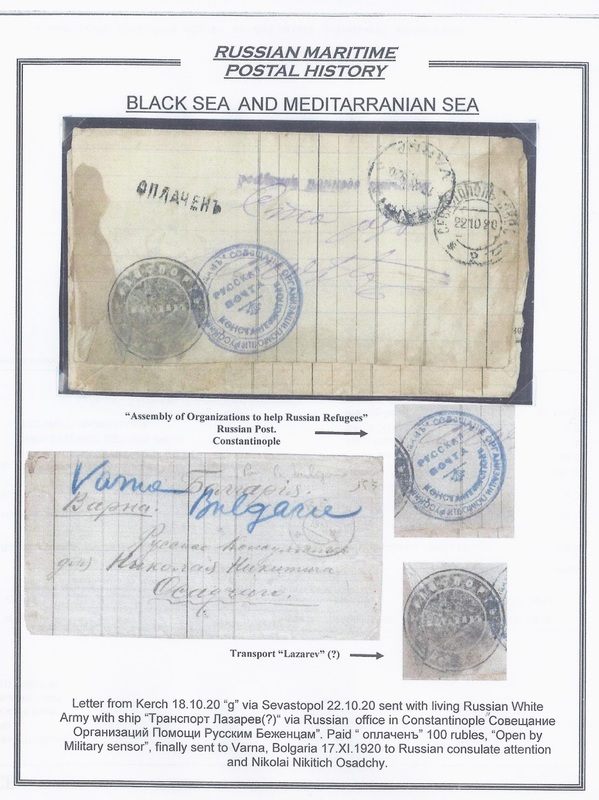 The blue mark reads in the centre Russian Post / Constantinople and around the outside Russia Refugee Aid Organisation - basically, a Hilfskomite. This suggests to me that mail carried by boat from White-controlled southern Russia to Constantinople was handed over to this Russian organisation which was able to organise onward transmission as required and without having to add any new (Turkish) franking to the letter. 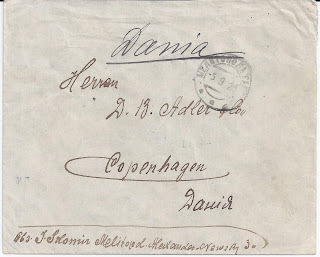 The presence of the Danish receiver mark suggests that this letter was entered into the Turkish mail stream in Constantinople by an organisation empowered to do just that. 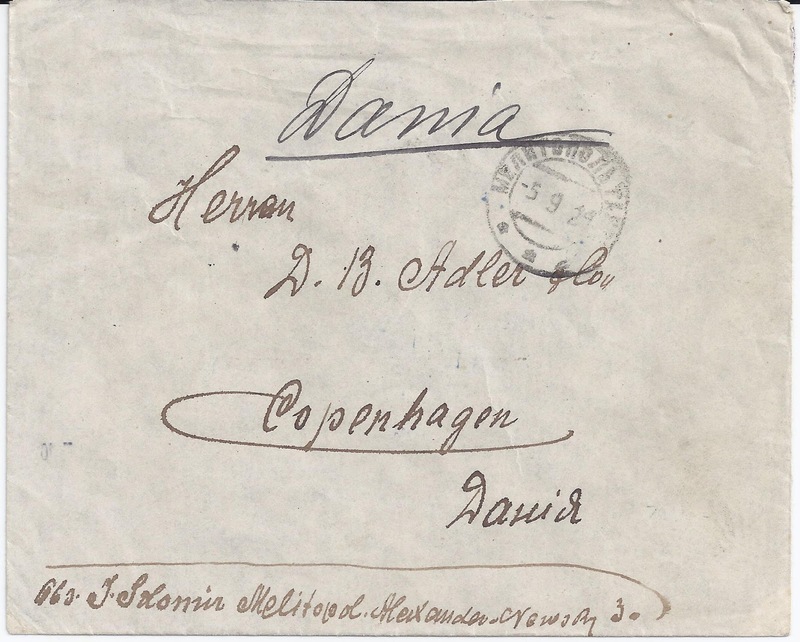 The addressee D.B.Adler was a private commercial bank (a Handelsbank) which had conducted business with Russia before World War One. The sender has an unusual and I assume Jewish name, Solomir, if I have read it correctly. Does anyone have any information about the Russia Refugee Aid Organisation?